Since 2010 Audi has been compressing all that it stands for into the A1 - a premium subcompact hatchback that has the measure of the urban environment but is also fit to go the distance - and the all-new second generation of this diminutively proportioned yet immensely successful entry point into the Audi brand is now waiting in the wings. Available exclusively as a five-door Sportback, the latest car features dynamic new styling that combines absolute modernity with classic detailing drawn from the brand-defining Ur quattros of the Eighties, and complements it with infotainment and driver assistance systems on a par with the contemporary full-size class. The new A1 Sportback also gives a nod to its Audi Ur-quattro and Sport quattro ancestry when viewed from the side: The wide, flat sloping C-pillar seems to push the car forward even while standing still. The roof contrast line, which is available in two dark colours, ends above the C-pillar. This gives the impression that the roof is flatter and the complete car is even lower-slung. All lines on the flanks, from the window edge to the sill, slope upwards towards the rear in a wedge shape. The distinctively highlighted wheels and the low shoulder line in between give the A1 Sportback a solid stance on the road. The low line between the edges of the wings draws the visual focal point downwards even further. In the UK the new A1 Sportback will be offered in conjunction with SE, Sport and S line specification options, and in S line form the car’s dynamic character is brought into particularly sharp relief through numerous features. These include larger air inlets, additional sill trims, an elongated slit centrally below the bonnet with two fins and a larger rear wing. In the top version at launch – the 2.0 TFSI with 200PS which will be available only in S line form - striking twin tailpipes also add to the air of strength and purpose. In terms of customisation options the latest A1 also expands on its predecessor’s already varied offering, and as a means of highlighting the scope for adding individual touches two striking Launch Edition models will be available in the UK at market introduction. Taking the S line specification as a foundation, and offered in a range of vivid colours, one will have a design focus and the other a more sporting slant. Each will feature elements such as large 18-inch wheels in either bronze, white or black depending on the exterior finish, darkened LED rear lights referencing the classic Sport quattro, exclusive black colouring for the Audi rings in the Singleframe and the model identifiers on the tailgate and various exterior and interior styling packages, including one with bronze accents. In the driver-focused cabin with its emotive, customisable design the eye is drawn in particular to the compact unit of air vents and the digital instrument cluster. All of the controls and touch-screen displays are strongly driver-oriented. The display and the air vent strip on the front passenger side are integrated into an area with a black glass look. In the dark, the cockpit can be brought to life by an optional contour and ambient lighting package that includes LED light elements in 30 selectable colours. Audi Virtual Cockpit, and the latter both of the above plus the various internet-based services offered by Audi connect and Audi Phone Box wireless charging functionality. The Audi smartphone interface which is standard for all versions ensures everyone is always well connected on board the new A1 Sportback. It integrates iOS and Android smartphones using Apple CarPlay and Android Auto into an environment in the MMI programmed specifically for them, and offers two USB interfaces (1x USB-A, 1x USB-C with increased charging current). Music and acoustics aficionados will be pleased to find a Digital Audio Broadcasting tuner featuring as standard, and the Audi sound system and Bang & Olufsen Premium Sound System available from the options list. The B&O system drives eleven speakers with an output of 560 watts. Its 3D effect uses the windscreen as a reflecting surface. The optional adaptive cruise assist is also radar-based. It keeps the Audi A1 Sportback at the desired distance from the vehicle ahead. If the vehicle is equipped with the S tronic twin-clutch transmission, the system covers a speed range of 0 to 124mph; with the manual transmission, the range begins at 19mph. 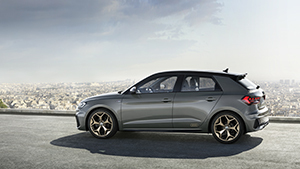 In stop-and-go traffic, the A1 Sportback with S tronic transmission brakes to a standstill and moves away again under certain conditions automatically. The new Audi A1 Sportback also offers various optional systems to make parking easier. For the first time, there is a reversing camera in addition to the rear parking system. The front ultrasonic sensors of the system recognise objects in front of the car and emit acoustic and visual warnings. The park assist system automatically parallel parks the A1 Sportback and, in its latest form, can also park forwards into perpendicular parking spaces, manoeuvring multiple times if necessary. The system can also exit parallel parking spaces. Whether around town or travelling further afield the powerful and efficient engines in the new A1 Sportback range measure up to the task in hand. There is a choice of efficient TFSI engines with outputs ranging from 95PS to 200PS, all enhanced by turbocharging, direct injection and a particulate filter as standard. Three engines will initially be available: the 30 TFSI, a three-cylinder unit with a 1.0 litre capacity and 116PS of power, a 150PS 1.5-litre four-cylinder engine with the cylinder on demand efficiency system (COD) in the 35 TFSI, and a 2.0-litre, 200PS TFSI with 320 Nm (236.0 lb-ft) of torque that will power the overtly performance-focused top model. These will be followed shortly afterwards by the 25 TFSI base engine with 95PS output. All engines can be linked to either a manual gearbox or the seven-speed S tronic dual-clutch transmission, with the exception of the 200PS variant which uses a six-speed S tronic transmission as standard. The chassis configuration of the new Audi A1 Sportback delivers agile handling and a compelling driving experience. The front suspension is a McPherson construction; a compact, lightweight torsion beam is used at the rear. As an alternative to the standard suspension, there is the option of a tauter sport suspension and an upgrade to a set-up incorporating adjustable dampers, plus a selection of other driver-focused additions including a sound actuator, red brake calipers and larger brake discs and the Audi drive select adaptive dynamics system. This allows drivers to select from four modes that influence the driving characteristics: auto, dynamic, efficiency and individual. The new Audi A1 Sportback will be available to order in the UK in September ahead of first deliveries in November.